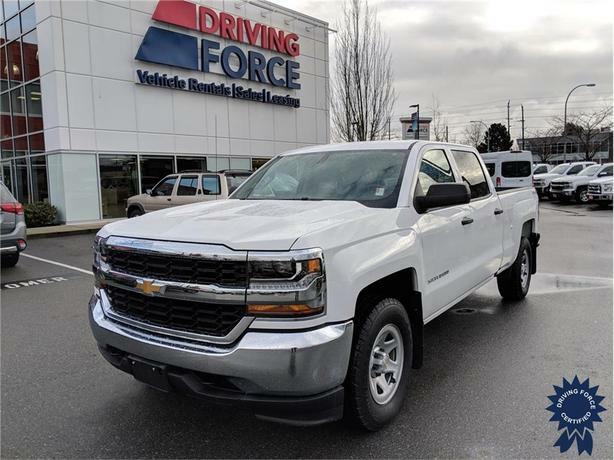 This 2017 Chevrolet Silverado 1500 WT Crew Cab 6 Passenger 4X4 6.5-Foot Medium Box Truck comes with a 153-inch wheelbase, 6-speed automatic electronically controlled transmission, electronic transfer case, 3.08 rear axle ratio, 17-inch wheels, front 40/20/40 split bench seat, cloth seats, Chevrolet MyLink Radio 7-inch Diagonal Color Touch Screen, AM/FM stereo, WT Fleet Convenience Package, Chrome Bumper Package, Trailering Package, Bluetooth streaming audio for music and most phones, 6-speaker audio system, deep tinted glass, black door handles, engine block heater, heavy-duty locking rear differential, integrated trailer brake controller, remote locking tailgate, outside heated power-adjustable mirrors, remote keyless entry, rear vision camera, and front frame-mounted black recovery hooks. The 5.3-litre EcoTec3 V8 gas engine with Active Fuel Management provides 355 horsepower at 5,600 RPM and 383 lb-ft of torque at 4,100 RPM. Touch base with us to discuss purchasing or financing options that are right for you and experience the difference you will only find at DRIVING FORCE Vehicle Rentals, Sales and Leasing.